Directions: (Exit 169) U.S. 101 in Santa Maria exit at Betteravia Road and drive east through the valley toward the foothills. Betteravia Road becomes Foxen Canyon Road as it curves to the south. At approximately 6.5 miles veer left onto Santa Maria Mesa Road before entering the small town of Garey. Continue east 4.5 miles to the stop sign at Tepusquet Road. Turn left (north) and drive into the canyon. You can follow this road over the summit all the way to Highway 166 to the north- a pleasant 15 mile stretch of canyon and oak covered foothills (approximately six miles to the summit from the stop sign). You can also reach Tepusquet Canyon from Highway 166 driving east from Santa Maria (Exit 175). It is 17 miles from the Highway 101-Highway 166 junction to Tepusquet Road. It is a two lane paved road with limited places to pull out, but do so where safe and not block driveways. Rewards: Pronounced "Tep-us-kay" (the Chumash word "fishing for trout"), the stream and oak woodland at the bottom of this canyon around the 7 mile marker is quite good for spring birds. Migrants move through the narrow riparian corridor along the creek, in the sycamores and shaded oaks of Tepusquet and include warblers, vireos, orioles, tanagers, thrushes and flycatchers. 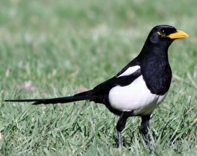 Common western birds are typical of the area. Steller's Jay is found in the cooler shaded portions of the canyon and in the oak woodland near the top of the ridge. You can access Colson Canyon and Los Padres National Forest from Tepusquet Road, but this is a dirt road with a few creek crossings and is not advisable for low clearance vehicles. Around the rocky outcrops listen for Canyon Wren. Costa's Hummingbird may also be seen in the sage and yucca in these rocky areas. Continue over the ridge top on Tepusquet Rd. to the north facing side of the hills where oaks predominate. This can be quite good for migrants as well. Directions: (Exit 164) U.S. 101 take Clark Avenue near Orcutt and continue east to Dominion Rd. Turn right (south) on Dominion to reach the intersection of Palmer Rd. Turn left (north) on Palmer and continue to the small town of Sisquoc. Total distance is about 5.7 miles from U.S. 101 in Orcutt to the town of Sisquoc and Foxen Canyon Rd. north portion. (Exit 154) U.S. 101 near the town of Los Olivos and travel east about 2.5 miles to reach the south end of Foxen Canyon Rd. Directions: (Exit 154) U.S. 101 at the town of Los Alamos take Highway 135 (Bell St.) west through town to Centennial St. Turn left (south) and drive a short distance past the elementary school to the park entrance on the left. Gate closes at dusk. Continuing beyond the park will take you up scenic Drum Canyon for a variety of woodland and chaparral birds. Rewards: This small county park provides a variety of common California specialties such as nuthatches, wrens, woodpeckers, bluebirds, titmouse, and Wrentit. Yellow-billed Magpie can be common here at times or just outside the park in the elementary school and around town. A drive up Drum Canyon might provide Lazuli Bunting, Nuttall's Woodpecker, Ash-throated Flycatcher and occasionally a Phainopepla. Directions: Drive 4 miles south of Buellton (Exit 140A) on U.S. 101 to Old Coast Road. Exit 101 here and drive 1 mile and turn left (east) onto Alisal Road. The park entrance is to the right 0.8 miles. From the town of Solvang (Highway 246), follow Alisal Road south about 6.5 miles to the park entrance. Gate closes at dusk. Directions: (Exit 140A) U.S. 101 at Buellton, drive east on Highway 246 approximately 6 miles to Refugio Road. Turn right (south) and cross over the Santa Ynez River into Quiota Canyon. Birding can be done at several places along the road where you can safely pull out. Rewards: This seven mile drive along Quiota Creek and into the canyon is excellent in spring and early summer for resident and migrant birds. Check the riparian habitat along the creek for warblers, flycatchers, vireos and orioles. The road crosses the creek at a few places into canyon and often provides the most productive birding. A few rarities have been recorded along the creek including five Hooded Warblers in summer of 1992. The road along much of lower canyon is easy to traverse, but is unpaved as you head up into the Santa Ynez Range. As you near the top of the Santa Ynez Mountains look for nesting Chipping Sparrows, Blue-gray Gnatcatchers and Black-throated Gray Warblers. Lewis's Woodpecker may be encountered in winter in the valley oaks near the entrance to the canyon. Directions: (Exit 140A) U.S. 101 at Buellton, drive east on Highway 246 (Mission Drive) approximately 3 miles to the picturesque town of Solvang. At Mission Drive and Atterdag Road turn left (north) and continue several blocks until you reach the park entrance on the left. Rewards: This scenic park in the bottom of a narrow canyon can be good for many western specialties and migrants in spring. Look for nuthatches, woodpeckers, jays, bluebirds and sparrows throughout the park. Walk the oak trees and willow-riparian habitat along the creek for more birds. Warblers and flycatchers are regular migrants along the creek in spring. Return to Mission Drive and turn left (east) to visit the SANTA YNEZ MISSION. The pepper trees around the Mission have been reliable for sapsuckers in winter. Park in the lot near the Mission buildings and look through the pepper trees in front and behind the Mission. In addition to enjoying the beautiful town of Solvang, be sure to look through the sycamore trees and power poles throughout town for the occasional wintering Lewis’s Woodpecker (rare). Rewards: This scenic drive through much of the ranch land in the Santa Ynez Valley is good for oak-savannah birds such as Lark Sparrow, Acorn Woodpecker, Bullock’s Oriole, Yellow-billed Magpie and Western Kingbird in summer. Lewis’s Woodpecker and Mountain Bluebird are both irregular visitors some winters. Just east of Highway 154 along Armour Ranch Road flocks of Horned Larks have held a few Chestnut-collared Longspurs in the open fields. As the road winds upward, you eventually enter the Los Padres National Forest. A stop in Cachuma Campground for birding along the creek is productive for migrants in spring. Vireos, flycatchers, tanagers, grosbeaks and warblers are regularly seen. The drive beyond the fork at Figueroa Mountain Road becomes Sunset Valley. Birding anywhere along this stretch of canyon is well worth the effort. Continue on to the shaded riparian habitat along Davy Brown campground and a check for more spring migrants. 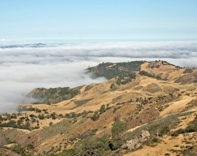 The road eventually terminates at Nira Campground and Manzana Creek at the San Rafael Wilderness a short distance ahead. Townsend’s Solitaires (winter) have been seen here. While Nira campground is open to the public, a Wilderness Permit is required to hike the Manzana Trail into the back country. Directions: (Exit 101B) From Santa Barbara, take Highway 154 (San Marcos Pass) from U.S. 101 north about 20 miles to the lake entrance on the right. Coming from the north, take Highway 154 east at its junction with U.S. 101 and drive about 20 miles to the lake entrance on the left. Camping, Eagle Cruises and boat rentals are available. BRADBURY DAM: Continue north of the Lake Cachuma County Park main entrance about 1.2 miles on Highway 154 to the Bradbury Dam Vista Point road on the right. Drive a short distance to the parking area. 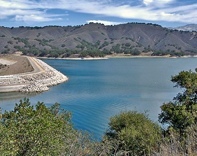 Rewards: This overlook of the Cachuma Lake dam and spillway will often be good for more waterfowl, grebes and loons that congregate at the lake’s west end. A spotting scope is helpful since many of the birds are some distance away. Oak woodland birds and sparrows are around the parking lot. Rewards: This narrow, interior stretch of the upper Santa Ynez River offers a mix of rocky canyon and riparian habitat. It is excellent in early summer for Swainson’s Thrush, flyactchers, warblers, Cassin's, Warbling, and the endangered “Least” Bells Vireo. 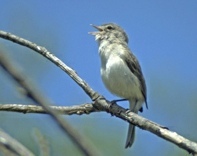 "Southwestern" Willow Flycatcher is also a rare breeder in the area. The Upper Santa Ynez River is recognized as an Audubon Society Important Bird Area (link >>). Directions: (Exit 101B) From Santa Barbara drive north on Highway 154 (San Marcos Pass) to Painted Cave Road. Drive north on the narrow Painted Cave Road about two miles to reach the park on the left. There is only a small pull out for parking, and RV's and trailers should not make the drive. A trail through the oak woodland takes you to the Painted Cave archeological site. Rewards: Much of the drive to Painted Cave Park is dominated by chaparral covered hills which is good habitat for a number of western bird species. 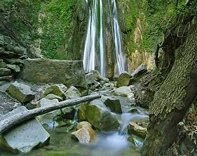 The shaded oak canyon along the trail to the Painted Cave site is excellent for spring migrants such as warblers, tanagers, flycatchers and typical oak woodland species. Directions: (Exit 101B) From Santa Barbara, drive north on Highway 154 (San Marcos Pass) about 8 miles to the turn off at East Camino Cielo Road. Exiting left (west) will take you to Kinevan Road- a short stretch of riparian habitat excellent for spring migrants. To drive East Camino Cielo exit to the right (east). Follow East Camino Cielo 11 miles to the fork at Gibraltar Road. Keep left at the fork and continue east along the ridge for about 6.7 miles where it descends down the north side (unpaved road at this point). It is about 5.5 miles to Juncal Campground. The Mono Debris Dam and Mono Camp are another 7.8 miles farther. This road is not recommended for low clearance vehicles or after heavy rains. *Note- A Los Padres National Forest Adventure Pass is required to park a vehicle on forest roads and must be obtained prior to entering.